Tulo argues Hudson's strike zone. knee and over the outer half of home plate (sz_bot 1.670, pz 1.494) while an earlier strike two call was a pitch located off the inner edge of home plate (px -1.361), the call was incorrect. At the time of the ejection, the Braves were leading, 3-1. The Braves ultimately won the contest, 11-2. This is Marvin Hudson (51)'s first ejection of 2013. Marvin Hudson now has -2 points in the UEFL (0 + 2 + -4 = -2). Crew Chief Tim McClelland now has 3 points in the UEFL's Crew Division (3 Previous + 0 Incorrect Call = 3). This is the 112th ejection of the 2013 MLB season. This is the 48th player ejection of 2013. Prior to ejection, Tulowitzki was 0-2 in the contest. This is the Rockies' 3rd ejection of 2013, T-4th in the NL West (LAD 9; ARI 7; SF 4; COL, SD 3). This is Troy Tulowitzki's 1st ejection of 2013 and first since May 20, 2011 (Rob Drake; QOC = Correct). This is Marvin Hudson's first ejection since October 1, 2012 (John Farrell; QOC = Correct). Two bad strike calls in one AB - yikes. 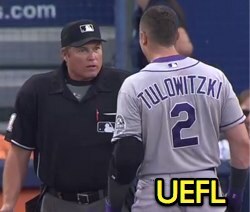 Looks like Tulo had a beef, especially with 2 LOB. I've been watching this game on MLB Network and I have to say through the first 3 innings Marvin Hudson is calling one of the most pitcher friendly strike zones I have ever seen. Inside part of the plate, Outside part of the plate, Up, and Down all seem to be strikes in this game and there is no doubt that the friendly strike zone is playing a part in Teheran's high number of strikeouts. No offense, but I'd lmao at the irony of that statement if your name was Eric GREGG. The question is: Is he being consistent about it? Hudson is struggling tonight behind the plate IMO. Yeah, don't want to call strikes over both the inside and outside parts of the plate. Hudson took over behind the plate the night before for Marty Foster, who was hit by a bat and then a pitch and left in the 7th (after hbp). Any word on Marty, who was replaced by Clint Fagan tonight? Word is no fractures, but a contusion instead; day-to-day. "Hudson needs to walk away." That made me laugh. Tulo is standing by the plate sniping at Hudson and the announcers really think he should have walked away? The question should be is he calling the rule book strike zone....you don't get to call your own interpretation of it as long as you're "consistent". Yep...the Rockies announcers are total homers. Tulo wasn't smart by sticking around, he could have remained in this game. That being said, he did have a beef with the zone, it was bad all night. All I wanted to know was whether or not he was calling that consistently. It's a really simple question, but since you've decided to read more into I have a question for you: What planet do you live on? Because while you're right, every umpire should call the rulebook zone, anyone that has spent any time around any level of baseball knows that umpires all have quirks to their strikezones. Human judgment isn't perfect and an umpire's strikezone is based on reference points that he can't see when the ball is actually crossing the zone. This imperfection means that the umpire's perception of where the strikezone is when the umpire is watching the pitch is likely not exactly the same as the actual zone. Those announcers are idiots. Hudson was down the line. Tulo wasn't going anywhere. "Hudson needs to walk away" is quite humorous. What they should have said is "Walt Weiss needs to get out there." WTF was Weiss doing for the 45 seconds or so that Tulowitzki was standing across the foul line going on and on about the pitch? I mean, you're a manager, get your player back to the dugout so we can continue the damn game. I blame Weiss 80% for this catastrophe, Tulowitzki 10% for not shutting up and Hudson 10% for calling a strike to begin with. It's a valid but inaccurate question. When I read all the comments... Typically by the same people... It's obvious to me that alot of people are stuck in their ways of thinking and NOT open to new thoughts or ideas. We ALL need to keep an open mind. The question was raised... Was he consistant ? Who cares if he was consistent . You can be consistently bad and consistently inconsistent . The question should be ... Was he accurate ? As long as he is consistent is one of the worst statements I hear about umpiring. If you are accurate , you will be consistent. But you can't be consistent and not accurate. "Hudson needs to walk away." Walk away to where? He's 15 feet up the line towards the ATL dugout. Tulo needs to walk to the dugout or to his position. That's where he can retreat to. These homers expect Hudson to walk up to the running lane? Give me a break. I don't think there's ever been a Rockies video posted on here where they have been either fair to the umpire or factually correct in the information they have given. Watch them try to figure out a balk call, and the homerism hilarity ensues. Can someone direct me to documentation of how the pitch location stats are read. Is this reading a 3-D or 2-D measurement ? Are the refernces different for different batters (Frank Howard vs Eddie Gaedel) ? I'm always open to new ideas, but not when they contradict the facts of a situation. Also, while I call it "consistency" to match what other people call it, the scientific term for it is "precision" and it is indeed possible to be precise but not accurate. Hudson should get more than that... if he doesn't miss the call the rest doesn't happen..
An accurate statement. I've grown up listening to these guys, I usually tune in to our radio station (their guy Korrigan is much better) or just watch the game on mute. A lot of our broadcasts anymore are layered with product placement and have less and less to do with the actual game itself, which is unfortunate. In this case I think they were just looking for some way to make Tulo look like he was in the right for sticking around long enough to get ejected, and keeping the focus off Weiss not coming out to protect his player and the poor call itself. The consistency question can be raised on borderline pitches. Accuracy is not affected by a borderline pitch being called a ball or a strike but you like to see an umpire be consistent on those borderline pitches. An inconsistent but accurate umpire would be one who calls borderline pitches in the same general location as both balls and strikes and does not really allow hitters or pitchers to establish the zone. So, in theory yes you can be both inconsistent and accurate based on your calls of the borderline pitches. On a side note both Mark Ellis and Don Mattingly were ejected by Alan Porter today for arguing a called strike 3 (px 0.989) in the 4th inning of the Dodgers-Cubs game. Seems to be a trend of incorrectly called strikes and ejections going on this week. that was a damn good pitch nasty one. it went right in strike zone just was caught law its a strike. I do agree that the better thing to do for Hudson would be to walk away and give the (professional) player the chance to stop acting like a stooge. THEN toss him if he follows you up the line. But this also works for dolts who argue balls and strikes! Hudson was where he was supposed to be, and last I checked, Tulowitzki isn't the Rockies' catcher.